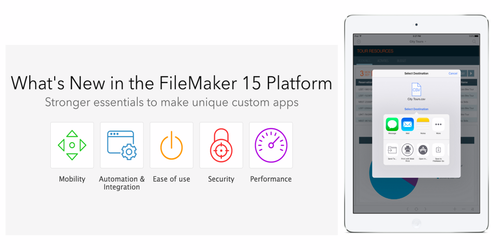 FileMaker, Inc., an Apple subsidiary, makes software that transforms businesses by enabling users to create and run custom solutions that work seamlessly across iPad, iPhone, Windows, Mac and the web. Millions of people worldwide rely on the FileMaker Platform to share information, manage projects, track assets and more. Use FileMaker Pro Advanced for more development and diagnostic tools to create and manage custom apps. Content customization – Leverage the unique capabilities of other apps on your iOS device to share and modify your FileMaker content. Enhance pictures in a photo editing app, send data to a mobile printer, exchange information with your organization’s internal proprietary app, and more. Cloud-based file sharing – Easily send and receive files including documents, images, videos, and more via cloud storage services such as iCloud, and popular file sharing apps on your device. Touch ID support – Securely access your custom apps by unlocking them with a touch of your finger. 3D Touch support – Get to the app you want right away. From the FileMaker Go icon on the home screen, directly launch recent files and access the Launch Center on 3D Touch-enabled devices. iBeacon support – Get location-based data from your custom app. When FileMaker Go is near an iBeacon you’ve previously set up, relevant information can be displayed based on data transmitted from your iBeacon. Automatically pull up information for a self-guided tour, product descriptions at the point of sale, the location of inventory in a warehouse, and more. Mobile phone support – In addition to the desktop and tablet, you can now use your mobile phone to access FileMaker apps in a web browser. The responsive user interface in FileMaker WebDirect optimizes buttons, fonts, and menus for a streamlined experience on your phone. Highlighted script errors – Red highlighted text helps you easily identify problem areas in the Script Workspace, saving you valuable development time. This feature is useful when importing scripts from other FileMaker apps, or for more complex apps with multiple scripts. Undo scripting – Ever accidentally delete something in the Script Workspace and wish you could get it back? Instantly recover your scripting work with multiple undo. Now you can undo and redo your work as many times as needed. Changes aren’t finalized until you both save and exit the Script Workspace. In-product updates – Receive in-product notifications, and instantly download and install the latest updates for FileMaker Pro right from within the product. ESS Adapter – Connect to even more External SQL Data Sources, including PostgreSQL and IBM DB2 using the ESS Adapter. Basic Starter Solutions – Get help creating your first custom app with the new basic Starter Solutions. These templates are available in the new “Get started” screen that displays when you first launch FileMaker Pro. Start managing contacts, inventory, content, and tasks right away. Web-based Help – Get faster results when searching for the FileMaker Pro information you’re looking for using the new web-based Help. Plus, you can even download Help and use it offline. Updated user interface – The newly designed status toolbar icons in FileMaker Pro keeps your custom apps looking fresh. Concealed edit box – Hide sensitive information you don’t want displayed on your screen. Characters you enter are masked by a “•” symbol. This feature is ideal for capturing information such as passwords, PINs, or credit card numbers. Proactive security warnings – Within the FileMaker Platform, warning notifications appear when connecting to a host or website that has an invalid security certificate. Plus, readily view details on existing certificates with the click of a button. In the Admin Console, administrators can prevent FileMaker Server from hosting apps that aren’t password protected with a simple checkbox, enabled by default. Plus, the Admin Console Log Viewer also includes more security-related messages that can be filtered for quick and easy identification. More SSL certificate types supported – FileMaker Server now supports intermediate, Subject Alternative Name (SAN), and wildcard certificates. Wildcard certificates allow administrators to secure a website URL and multiple subdomains with one SSL certificate, reducing administrative time and cost. SSL certificate enhancements – It’s even easier to protect your FileMaker data. FileMaker Server now supports SSL certificates from more popular vendors. Easily request and install 3rd-party intermediate certificates with the new built-in certificate signing request form in the Admin Console. Top call statistics logging – Quickly diagnose any slowdowns within the FileMaker Platform. FileMaker Server shows the top 25 calls from connected clients that are taking the longest time to process. Identify which clients are affected and the duration of the call. Portal in-line progress bar – Be more productive while working with your apps. Filtering and sorting data now takes place separately from other operations so you can continue to use your app while these processes are running. The progress bar lets you know when the task is complete.